über gleiches Thema auf Deutsch and mail this URL to your friends! Freedom of Information - also known as access to information (ATI), the public's right to know or administrative transparency - gives citizens access to official information hold by government and other public authorities. In 1766 a Freedom of Information Law (Tryckfrihetsförordningen) was introduced in Sweden-Finland, thanks to a Finn named Anders Chydenius, who fought for democracy, equality, and respect for the human rights. Since then more than 110 countries (2004, 2005, 2006, 2008, 2009, 2010, 2011) adopted such laws with approx. 5.5 billion (2012) inhabitants. Approx. 50 countries guarantee FOI in constitutions. More then approx. 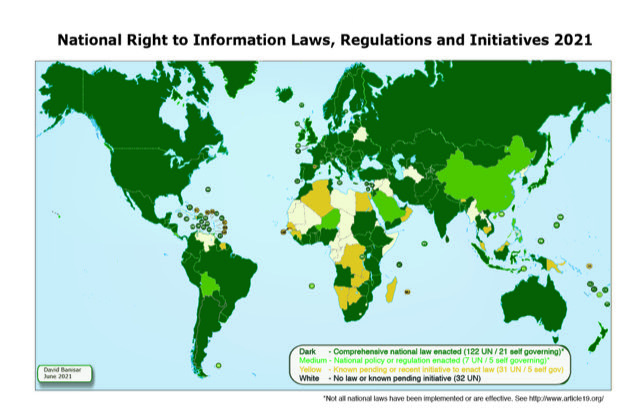 450 million inhabitants live in countries with access to information in constitution only. ATI is now firmly recognised as an internationally guaranteed human right, with decisions at the Inter-American Court of Human Rights and European Court of Human Rights, and global recognition by the UN Human Rights Committee. RTI-Rating.org rates laws according to international standards. Here is a list of countries with access to information in constitution only with more then approx. 450 million inhabitants. 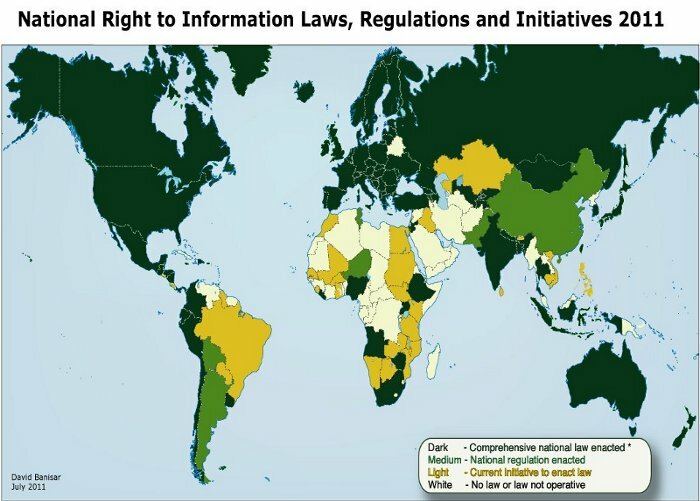 In some of these countries citizens have practically no access to public documents. Some others offer access as countries with laws. In addition 24 Commonwealth's member states support the Right to information as part of speech and expression. Thanks to Roger Vleugels "Overview of FOIA Countries Worldwide – February 1 2006", Overview of all 86 FOIA Countries, September 22 2008 (update 2009: 90 States, update 2010) and others who provided this information. Please do not hesitate to mail me if you have additional information. The site http://right2info.org/ publishes both laws and constitutional provisions.